If you’ve been around long with Fandible, you know a few solid facts about us. David has no actual voice – just a collection of accents that he steals from the throats of sleeping children. Jesus is as graceful as the hippos dominating the dance in Fantasia. Dan is two tablets away from becoming a floating brain in the jar. Angela is the official ADULT, and I, Billy, like zombies. No, let’s readjust that last bit. I love survival horror zombies. I’ve never been much of a fan of those comedic zombie movies (Shaun of the Dead does get a pass… for now) nor those action-packed movies that involve a man with a chainsaw, a cigar, and him mowing down a tide of zombies. No, I like my zombies deadly, my protagonist desperate, and my camera shakey. This is what drew me to the original Resident Evil 2 game. While I enjoyed the first game immensely, it always felt more like an action game than actual survival horror. It was the characters – they were an elite band of soldiers with skills very few people possessed! If anyone could have survived the Spencer Estate, it was going to be them! But in Resident Evil 2, you weren’t some special agent in some special club. You literally are playing Leon, a rookie cop, and Claire… a college student. You didn’t go looking for trouble in the middle of the woods! No, you were just trying to get to a city to either start a new job or find family! Leon and Claire, for me, are the best representation of what makes GREAT survival horror – they aren’t the best. Heck, they might not even be that good at surviving… but they’re good enough. Good survival horror is about scraping through every drawer in a room in hopes to find a single bullet that you can use on the monster hammering on the door or against yourself if you finally give in to the creeping insanity whispering in your ear. Good survival horror allows for the setting and atmosphere to become its own character which you hate because all you want is a moment of peace. Good survival horror is about the average joe trying to survive the impossible. Resident Evil 2 was good survival horror. So when I found out they were remaking Resident Evil 2, I was worried. For the last couple of years, Resident Evil has turned from survival horror to just action horror. And while the Resident Evil 7 game brought us back to the roots, I still was worried that I’d end up with Leon Kennedy riding through the streets of Raccoon City in a tank and smoking a cigar. I’m pleased to announce that my fears were completely unwarranted. The remake of Resident Evil 2 is a nigh-perfect recreation of the original game. Is it worthy of me dubbing it the perfect game? No. Frogger has that title. However, it’s close. 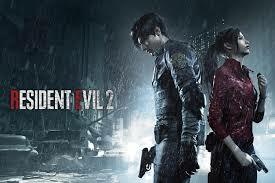 The thing that Resident Evil 2 has is Atmosphere. From the archaic museum-turned-police station to the crumbling sewers to the oddly serene shimmer of the Umbrella underground lab, the atmosphere is a thing of beauty that is with you from start to finish of the game. Each room serves a purpose, every enemy placement is well thought out, and with the right difficulty setting, you are left making every bullet count. Do you like puzzles? I love them. And they are a staple of Resident Evil. And this remake doesn’t disappoint. You’ll be stumbling through the dark trying to find keys and combination, both cursing and thanking the developers with each crash of a window as a zombie climbs through. The story is pretty standard – it isn’t reinventing the wheel. And it doesn’t need to reinvent the wheel. If given the proper atmosphere, all you need to do is dangle the exit sign in front of the character, and that’s the story. The story has some cliche moments – but again, you forgive these because the original was from 1998 when these ideas actually felt new and fresh. You beat one scenario, you play the second scenario, and then you get the true ending. All in all, near perfect. But it isn’t completely perfect. The characters’ dialogue is weird. Sometimes it’s incredibly realistic and dark. You hear some truly horrific things from the likes of Kendo or Sgt. Marvin. Yet, spliced between this incredibly realistic and dramatic dialogue is… corniness. Especially with Leon who seems to be the embodiment of Moral Compass. And while a part of me feels this corny dialogue is a tip of a hat towards the origins of Resident Evil (Jilly Sandwich, anyone? ), mixed with this new and engaging dialogue, and it becomes pretty evident that there is an odd tonal difference. The other issue I have with the game is the second scenario. If you complete the first character’s story, you can opt to play the second scenario of the OTHER character you hadn’t played. It starts you off in a different location, and you experience different things. Which is fantastic! I love this. However, the things that don’t change, at least at the beginning of the second scenario, are the puzzles. You’ll find yourself completing the same puzzles as before (Oh… so BOTH Leon and Claire need to get the plaques. Okay…) And while this becomes less and less evident as time goes on, it still feels strange to make the effort to tie both stories together but to leave the same puzzles that need to be figured out. So A for effort but they don’t quite succeed in these two things. Resident Evil 2’s remake is a fantastic recreation to the original Resident Evil 2. And with them keeping it heavily in survival horror and away from action horror, I have a renewed hope for the Resident Evil series. Perhaps we’ll get Resident Evil Nemesis! Or even better – a return of Resident Evil: Outbreak! All I know is that I’ll be ready when Capcom starts hinting at announcing a new game. Pretty much agree on the pros & cons here Billy. It’s hard to give them a pass when they were remaking the game they couldn’t have changed up the layout/puzzles for scenario B? Oh well, still an awesome game and scariest, sphincter-tightening moment was anytime I had to quietly move past lickers(dog kennel gets gold star).